Our contact lens specialists at Zacks London Eye Clinic (Warren Street, Fitzrovia, London W1) fit hard, rigid gas permeable contact lenses also known as RGP or GP contact lenses from several different suppliers so that we can prescribe the most appropriate visual solution for your eyes and lifestyle. Hard, RGP contact lenses are tailor made from rigid plastic materials which are now generally called gas-permeable (GP) due to their oxygen permeability. Hard, rigid gas permeable (RGP or GP) contact lenses are easy to handle and extremely durable. If well cared for they can last for a long time. RGP contact lenses also offer health benefits over soft contact lenses: They don’t dehydrate, are less likely to harbour bacteria and they allow more oxygen to pass to the eye by floating on the tear layer. Since they retain their shape, gas permeable contact lenses usually provide sharper vision than soft contact lenses. Though because of their rigid structure, gas permeable contact lenses do require some adaptation, becoming more comfortable over time with regular wear. Hard RGP contact lenses are excellent for treating high astigmatism and irregular astigmatism arising from corneal injury or disease. 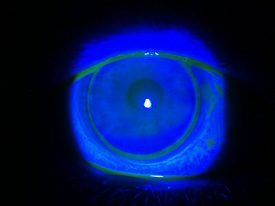 For patients with Keratoconus, hard RGP contact lenses are most frequently fitted as a first choice option because they can provide excellent visual correction. A reading addition can be incorporated into the front or back surface of a progressive RGP multifocal contact lens to provide sharp vision at all distances. Scleral contact lenses are very large, RGP contact lenses which fit onto the sclera or white of the eye. They are useful when the corneal surface is very irregular or dry. Mini Scleral or Semi-scleral contact lenses are bigger than conventional corneal RGP lenses and smaller than full scleral contact lenses, providing a stable, comfortable fit. Orthokeratology overnight vision correction (OVC) involves using specially designed rigid gas-permeable contact lenses to alter the shape of the cornea to reduce or correct myopia (short-sight). For more information on RGP contact lenses or to find out if they are suitable for your eyes, please contact us to make an appointment for a consultation at our London practice.